British officials in Pakistan have met police there to try to find militants suspected of encouraging a failed suicide bomber, the BBC has learned. Islamic convert Nicky Reilly, from Plymouth, was sentenced to 18 years in prison for the attack on The Giraffe restaurant in Exeter last May. Devon police said they believed Reilly was in contact with two militants via the internet. Police said they would send officers to Pakistan if there were promising leads. Simon Hall, BBC South West's Home Affairs Correspondent, said British Embassy officials in Pakistan held their first meetings with the country's police and intelligence officers as part of the attempt to find the men. A terrorism expert from Exeter University said the meetings indicated Pakistani authorities were devoting significant resources to the inquiries. Bill Tupman, of the university's politics department, said: "It's showing that they are taking it seriously because Pakistan is beginning to recognise the depth of its own problems. "The problems are not only with its own Taleban, but with the Kashmiri militants who are the main suspects behind suicide bombings in places like [Exeter]. "They very much want to be seen to be helping because they want our expertise to help them." Mr Hall said: "Devon and Cornwall Police admit it will be difficult to bring them to justice, but say they have a duty to try. "They will consider sending officers out to Pakistan if they uncover promising leads." Reilly, who has learning difficulties and Asperger's syndrome, pleaded guilty at the Old Bailey to attempting to detonate bombs in plastic bottles that were also filled with about 500 nails. 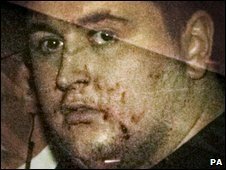 He was the only person injured in the incident when a bomb went off in his hands in a toilet cubicle as he prepared for the attack, in May 2008. Dozens of customers then fled in panic. Reilly has been moved from Belmarsh Prison to Broadmoor mental hospital. He has been undergoing a series of tests that will determine if he is spend the rest of his sentence in a mental hospital or prison.